It might be named after two other plants, but the willow peppermint has charms all of its own, writes Mark Clark. Kiwis and Aussies love to sling off at each other, but we're happy to spend our hard-earned cash in each other's tourist hot spots. Over the past few decades, I daresay millions of Kiwis like me and my family have holidayed on the east coast of Australia between Cairns and Melbourne. The Gold Coast and the Sunshine Coast are a popular choice for us southerners, thanks to direct flights from Dunedin to Brisbane. Just inland from the Gold Coast and down a bit is where today's tree grows naturally. It's the New England area of New South Wales, the home and electorate of beleaguered Australian politician (and erstwhile "secret" New Zealand citizen) Barnaby Joyce; the one with the huge white hat and new second family. Media celebrities aside, if you were asked to pick a tree that symbolises Australia, you'd be in good company opting for the gum tree. Tall, thin trunks; bare, lanky limbs; and drooping, dull green leaves sum up most of the bush along Australia's Pacific coast. So much so that it boggles the mind to find out that there are about 700 Eucalyptus species, 113 Corymbia species and 14 or so Angophora species that could loosely be called "gum trees". How on earth does the average person tell one type from another? 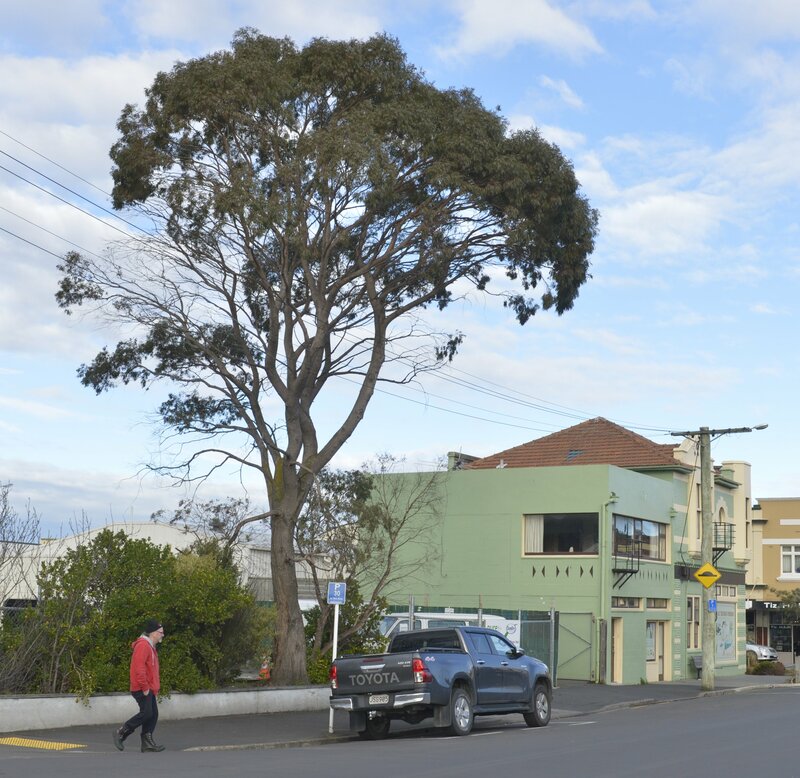 One of those many types of eastern Australian gum trees towers proudly over cars and pedestrians in the South Dunedin shopping area, a place not usually associated with impressive trees. It's the willow peppermint, or narrow-leaved black peppermint (Eucalyptus nicholii), beside the footpath in McBride St, just around the corner from King Edward St. A few of its lower branches have been lopped off, but its shaggy tresses of matt grey-green leaves are still a lovely sight against a clear blue winter sky. A large old willow peppermint in the front garden of 198 North Rd, Northeast Valley. Even though this species is one of the smaller eucalypts, this photo shows why you have to be careful where you plant young specimens in suburban gardens. Even though they come from a fairly small, high-altitude area in northern New South Wales, willow peppermints are a firm favourite with gardeners on both sides of the Tasman, including the southern South Island. They soldier on stoically through icy southerlies, frosts, droughts and general neglect. 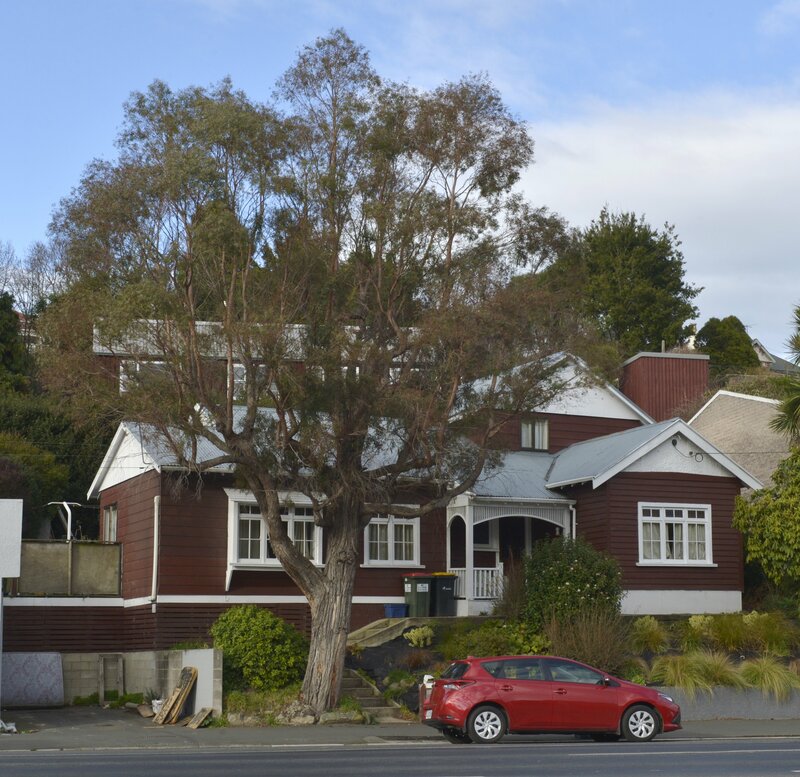 While they're one of the smaller eucalypts, the size of some Dunedin trees shows why you have to be careful where you put them in your garden. Some gum trees have smooth, beautifully patterned bark and a few have showy red flowers. With willow peppermints, it's all about the leaves. The long, thin, older leaves are attractive enough. They have the iconic sickle shape and sun-bleached look that you expect wherever gum trees grow in Australia. But it's the new spring growth that's worth waiting for: fountains of delicate bronze- or plum-coloured young leaves that upstage anything else the tree does. Compared with that, the tiny white flowers, woody seed capsules and grey fibrous bark don't make much of an impact. The "willow" in "willow peppermint" seems logical enough for a tree with long, thin drooping leaves. And it's true that the tree looks like about 10 other eucalypts called "peppermints", even though it's officially a "false peppermint" (go figure!). I do wonder, though, why Aussie settlers couldn't have done better than to name such a handsome tree after two other plants. As for "narrow-leaved black peppermint", why does it sound like something dreamt up by a committee? And what's with the "black"? No wonder most of us stick to the botanical name, Eucalyptus nicholii, which honours Richard Nichol (1866-1947). Young Richard migrated to Australia from Ireland and became the secretary to esteemed plant author Joseph Henry Maiden, at the Sydney Botanic Gardens Herbarium. I've been a secretary in a couple of roles at Lands and Survey, and then Doc. For all fellow secretaries out there, isn't it a nice change to have such a beautiful tree named after one of us instead of one of the glory boys.